Holiday homes in Eastbourne: Take your pick! Holiday homes in Eastbourne are in high demand, as an increasingly upmarket and international crowd begin to appreciate the sunshine, sensational setting and wide range of entertainment on offer. Thankfully here at Exclusively Eastbourne Holiday Homes we’ve managed to source more high quality accommodation, in the best parts of town, enabling you to get the very most out of your precious holidays. Town house with sea views, detached family home, beachfront apartment, central bolthole, marina-side villa, you can rest assured we’ve been busy bringing you inspirational options this summer and, importantly, providing you with fresh availability when many holiday properties have long been booked. How about Quayside, for drinking in the waterside views of Sovereign Harbour, with boats moored just feet away from your private terrace. It’s a glorious setting for families or groups of friends, with spacious, modern accommodation for six, with four bedrooms. It’s well appointed, with a great Sky TV package provided, off-street parking space and should you run out of chilled Chianti, the bars, cafes and entertainment of the Waterside complex is a short stroll away. 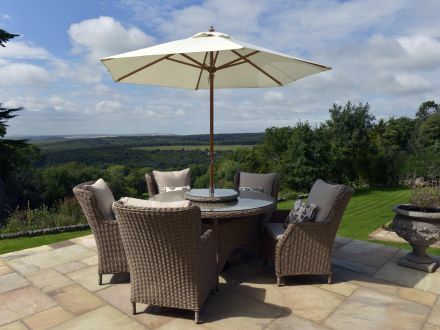 If you are after family accommodation and you don’t fancy compromising on space you should consider Stone Cross House, with four bedrooms, private south-facing garden and all the trappings of a modern home. Based in the attractive hamlet of Stone Cross, close to Polegate, so well placed for easy access to the coast at Eastbourne and Pevensey and inland to the green, historic spaces of East Sussex. The house becomes available at the last week of August. For the ultimate central Eastbourne location, Pier Walk takes some beating, with Eastbourne pier and beach moments away, with cafes and restaurants galore, four theatres and a gallery within a 10-minute stroll. Unusually for this location, the apartment has private outside space and given the complete refurbishment being undertaken, all the fixtures and fittings are immaculate and well-appointed. Available from August, this 2-bedroom holiday apartment is priced keenly will be high demand so act quick to book the dates you fancy. Beachfront Apartment provides a complete contrast, allowing you to unwind, with balconies overlooking the beach at Sovereign Harbour. Two bedrooms, two bathrooms, allocated parking space and modern, but comfortable accommodation will again ensure that this holiday let in Sovereign Harbour is highly sought after. It’s been a pleasure to see Eastbourne grow in popularity over the six years we’ve lived in the town and the businesses (we also own and run The Guesthouse East) I hope have helped to ensure that accommodation available is well aligned to the strong, positive dynamic behind our vibrant, sun-blessed town.